Sharks in the Philippines are seeing a dramatic reduction in numbers. Courtesy Eddie Fabrigas Rebueno. Manilla, August 20 2018. Described as a “highly feared apex predator of the sea,” sharks have been on this planet for some 400 million years. They possess replaceable razor-sharp teeth that grow in tens of thousands over a lifetime. Purely designed for killing and eating. Sharks help maintain the delicate balance of marine ecosystems. “They are top predators,” says Dr. Arnel “AA” Yaptinchay, founder and director of Marine Wildlife Watch of the Philippines. “Sharks maintain healthy ecosystems by keeping fish populations in check. They remove weak individuals, keeping fish stocks robust,” he adds. Dr. Arnel Yaptinchay. Courtesy CTI-SEA. Dr. Myers, a former American government scientist, has warned that overfishing could lead to collapse of Atlantic cod populations and also noted that 90% of the world’s bluefin tuna and other large predatory fish have already disappeared. The outlook for sharks and large predators is not good. More than 400 species of shark roam around the world’s oceans. And in recent years, the Davao Gulf in the Philippines has become a home and migration path for several species, including whale sharks. And some of the most dangerous sharks in the world roam the waters of the more than 7,000 islands in the Philippines. “Sadly, humans have always been very good at killing big animals,” noted Dr. Myers. “Ten thousand years ago, with just some pointed sticks, humans managed to wipe out the woolly mammoth, sabre tooth tigers, mastodons, and giant vampire bats.” He said the same could happen in the oceans. Studies show that around the world, people kill nearly 100 million sharks and billions of other sea animals each year. And although concerns for sharks are high, shark populations continue to decline due to lack of fisheries management and rampant illegal, unreported, and unregulated fishing, according to a report released by the Worldwide Fund for Nature and Traffic (WWF). Data submitted to the UN Food and Agriculture Organization (FAO) said that between 2000 and 2008 the Philippines reported exports of dried and salted shark fins (averaging 36 tons/year) and shark liver oil (19 tons/year). This has to stop, said House Speaker Gloria Macapagal-Arroyo recently. “With over 200 species of sharks and rays in the Philippines, our country plays a crucial role in conserving these ecologically and economically important marine species,” Arroyo said. Arroyo says that due to their unique life history traits, sharks and their relatives reproduces slowly, making them particularly vulnerable to threats from targeted fisheries, overfishing, bycatch, pollution, unregulated tourism, and climate change. “A declined population will find it hard to recover without special conservation attention,” she adds. A dead shark found near Tagum City, Philippines. Courtesy Darrel Blatchley. Aside from ecological benefits, sharks have also been proven to boost local economies through sustainable tourism activities. “You can [benefit from] live sharks over and over again throughout their lifetime. But once they are dead, you can use them only once and nothing more,” Dr. Yaptinchay says. Arroyo says the bill, once passed, will see fines and penalties for those who will kill, take, keep in captivity, inflict injury, harass and trade vulnerable, threatened, endangered or critically endangered species. Penalties include imprisonment of up to 12 years in prison and PHP1million (US$19,000) fines. “This bill aims to find the intersection between management and utilization in the hopes of finding the balance between human needs and the integrity of the Philippine marine ecosystem,” Arroyo points out. But humans kill sharks in other ways. Last August 7, a dead 3.5metre whale shark washed ashore near Tagum City, Davao del Norte. “It died of ingested toxic waste,” said Darrell Blatchley, owner of D’Bone Collector Museum in Davao City. Blatchley and another Filipino science researcher performed a necropsy examination of the marine animal that found plastic cups and sandwich bags inside the animal’s stomach and multiple candy wrappers blocking its gills. “It died of toxic waste, which was ingested.” - Darrel Blatchley. “I am angry,” says Blatchley who has performed necropsies on 60 whales and dolphins, countless turtles and megamouth sharks in recent years. “Nothing has changed. Man causes the death of these marine animals.” The problem is growing worse. Other necropsies have found plastic bags to be common in whales' stomachs, leading to critical obstructions in digestive systems and eventual death. In 2017, a dying Norwegian whale was found to have more than 30 whole plastic bags in its stomach. It had no food in the stomach at all. And recently, another peak predator was found with 800 kilograms of plastic in its guts. Although a recent WWF report has classified the whale shark and manta rays as protected species that are banned for export, there is no protection for them from the impact of their habitats. “Whale shark aggregation sites have been identified as priority conservation areas. But there is no study on population estimates of any species of sharks in the Philippines,” the WWF report said. As a result, the outlook is not good. One 2015 study found that up to nearly 20% of key marine predators in the Mediterranean had plastics in their bodies. Another study from South Africa, where sharks are still plentiful, found that over 7% of the tiger sharks examined had some sort of plastic in their stomach. And just as worryingly, up to 33% of the shark fins sampled in Chinese cities were classified as unsafe for human consumption based on the levels of methyl mercury in them. "We could actually do something about plastic, right now" - David Attenborough. Courtesy Wikipedia. Some reports suggest that by 2050, there will be more plastics than fish in the world’s major seas if things go on as they are. Major celebrities like Sir David Attenborough echo the same warning. 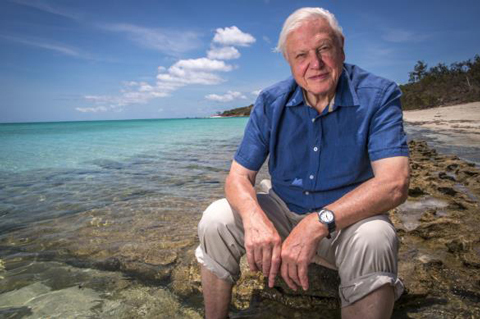 Attenborough labelled rising global temperatures and plastic as the biggest concerns for our oceans.